Instructor User Guide LessonsHow do I allow comments to be posted on a Lessons page? 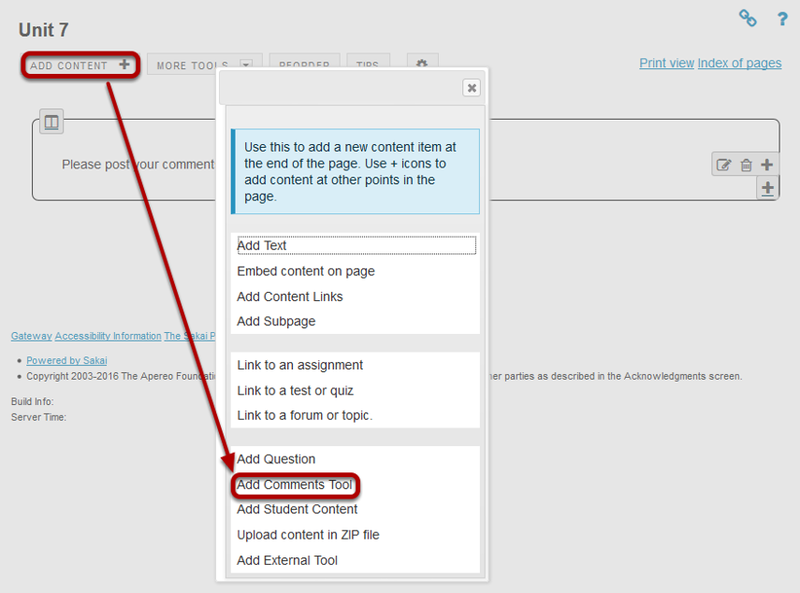 Instructors can allow students to add comments to a Lessons page. The comments can either be anonymous or have the student’s name attached. The comments can be graded and either required or optional. Note: Students have 30 minuets to edit or delete their comments. 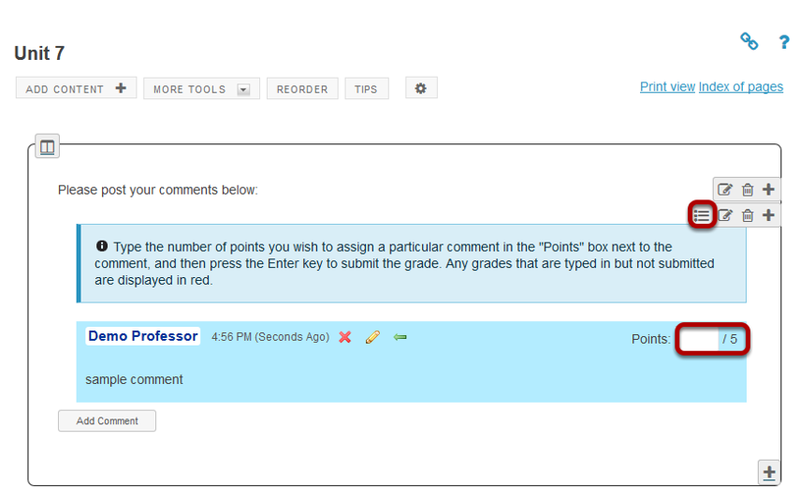 Instructors can edit or delete a student comment at any time. Click on the Lessons Page Title (e.g. Unit 7) in the Tool Menu to display the page. Note: The default or blank Lessons page contains text and images that explain the basic functionality of the Lessons tool. Click Add Content, then Add Comment Tool. Zoom: Click Add Content, then Add Comment Tool. From the Add Content drop-down menu, select Add Comments Tool. View Comments tool on page. Zoom: View Comments tool on page. Click Edit to view or modify the comment properties. Edit the comments tool properties as needed. To make comments anonymous, check the box nest to Keep Comments Anonymous. Check the box next to Create Gradebook Entries, if you would like to grade the comments, and enter a maximum point value. If you would like to restrict this item based on a prerequisite, check the box for Don't release item until all prerequisites are completed. If students are required to add comments before moving on to a different Lessons item, check the box next to Require This Item. Note: Students CAN read other students' comments in this tool. This will return the display to the Lessons Page with the Add Comments button. If the comments are graded, you may enter grades directly on the comment page, or click on the Grading Pane icon to enter scores there. Prev: How do I add an in-line question to a Lessons page? Next: How do I allow students to add content to Lessons?